My name is Jack and I am a recovering father. It is not a joke. As a parent you are always recovering from something that your children have done, might do or are doing. It is a never ending battle to maintain your equilibrium. 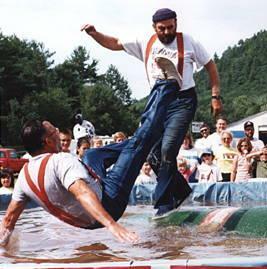 In my mind's eye I like to imagine a lumberjack in one of those logrolling contests. The log spins one way and then suddenly it spins another. I am forever working hard not to fall off of the log. It is not easy, there is always something. And like so many things in life much of the spinning is financial in nature. This is not the first time that I have blogged about this. I started to search for the initial entry, but I never did stumble across it. However I did come up with this little ditty from last March. "All of this begs the question of when does sacrificing for your children cross the line of reality and common sense." It is a smart question and one that I am finding hard to answer. I am a big proponent of education. It is an investment in the future. There is nothing hokey or cliche about that, it is fact. But that doesn't change the reality of trying to ascertain when to say enough is enough. The impetus for this post showed up in the form of a letter from the school advising me that tuition for next year will soon come due. It was like someone dumped a bucket of cold water on my head. I was not pleased. At 4 am I was still pacing the house trying to figure out what makes the most sense. There is no question that I can continue to maintain his place in the school for another year or two. But that doesn't indicate the sustainability of it beyond that time frame and in truth I find it galling to consider how much I have already spent. Here is what I know. His mother and I are quite happy with the school. The secular and Judaic studies have been excellent. The teachers are outstanding. He has made some incredible friendships and there is no reason to believe that any of these things will change in the near future. At the same time I have to ask myself if I am being foolish. Would it not be smarter to try and move to a place where the public school was a real option. Why not apply these dollars to my home. Part of the reason that I don't want to move him is because I am more than satisfied with the education and because he would be devastated. That doesn't mean that he wouldn't get over it and that he wouldn't do well elsewhere. I am confident about all of these things. But this is one of those areas where it hurts me to think about telling him that he cannot go to school there any longer. In general I don't let six year-old children dictate how I live my life, but I just hate the idea. So I am going to sit on this for a bit and consider all of my options. Who knows maybe I'll win the lottery and the point will be moot. That's very tough. I know more than one family in the US who, while they aren't all that religious, seriously considered sending their kids to either a Conservative or Reform day school- until they found out how exhorbitant the tuition was. Same with buying kosher meat- they thought they might be willing to give it a try until they saw how much more expensive it was. Like you said, there's always the lottery- or how about selling a kidney? Seriously, good luck with whatever you decide. I grok. Next year, we're looking at having two kids in a Jewish school (this year was only one child), and we quite simply can't afford it. But the public alternatives are considerably below the standard set at the Jewish school, and I think I'd regret that decision for life. The best we can do is hope for scholarships or other financial aid. It is irritating, isn't it. This is a very important topic. Probably the most important post so far. In my opinion stick to the Jewish education at the expense of other things. Downgrade your flashy car or something. I hear you Jack. I have a similar problem although my little one is not in day school...yet. I have had a lot of pressure from other members of my shul as well as our Rabbi to send her. Then on top of it, she talks about wanting to go there all the time. But as a single Mom and at these costs how can I manage? I better go buy a lottery ticket. In our case, spending $30,000 a year for day school is simply not going to happen. We just cannot afford it. And, Shwarma, when day school costs that much, it is a little bit more complicated than downgrading a "flashy" car. (We have a Honda and Chevy, by the way). Anything like that out by you??? It is funny how the grass is always greener. I wish that my kid's school had the same tuition schedule. But to quote my grandfather you play the hand that you are dealt, not the one you wished that you had. If there was a decent public school to choose from I would be much happier. I like your log-rolling metaphor, Jack. I agree that much of parenting involves decisions like that. I procrastinated but finally made an appt. for my daughter with an orthodontist. FOrtunately my older two boys didn't need it. It's a luxury, but not one that I'm willing to give up. It's a luxury, but not one that I'm willing to give up. I just had a discussion about orthodontia with a good friend. He told me that if he took the money that he spends on school and braces he would be able to retire ten years earlier.